It’s been a long, lonnnng time since I’ve posted to this blog, but I’m happy to be back with new recipes (the result of lots of summer cooking and baking!) this week. Hopefully this post kick starts my lazy blogging bum into gear, and I’ll be back with more recipes in the weeks and months to come! And finally, let’s talk about cornbread. I LOVE cornbread. I’ve tried every conceivable type of cornbread known to man or woman, and this recipe is HANDS DOWN the best. It has the rare combination of perfect flavor (not too sweet, not too bland) and perfect consistency (not too cake-like, not too dry). I can’t imagine a better accompaniment to this spicy chili. Enjoy! Heat a large stock pot over medium-high heat. Crumble the ground turkey and sausage into the hot pan, and cook until evenly browned. Drain off excess grease. Pour in the chili beans, diced tomatoes and tomato paste. Add the onion, habanero peppers, bouillon, and beer. Season with chili powder and remaining ingredients (through sugar). Stir to blend, then cover and simmer over low heat for at least 2 hours, stirring occasionally. After 2 hours, taste, and adjust salt, pepper, and chili powder if necessary. The longer the chili simmers, the better it will taste. Remove from heat and serve, topped with shredded cheddar cheese (or refrigerate and serve the next day). Melt butter and honey in large skillet. Remove from heat and stir in sugar. Quickly add eggs and beat until well blended. Combine buttermilk with baking soda and stir into mixture in pan. Stir in cornmeal, flour, and salt until well blended and few lumps remain. Pour batter into the prepared pan. I celebrated my 33rd birthday late last week, and spent my special day on an amazing holiday in Garmisch-Partenkirchen, a stunningly beautiful ski resort on the German border with Austria. I managed to cram all my favorite activities into the day: hiking, playing in the snow, exploring historic sites, and enjoying my hubby’s company. I also discovered what will be, for the rest of my days, a delicious birthday cake substitute: the Brookie. Beat vegetable shortening and sugar with an electric mixer in a large bowl until smooth. Beat in one egg until completely incorporated. Beat in second egg along with vanilla extract and water. Combine flour, cocoa powder, baking soda, and salt in a small bowl. Stir flour mixture into creamed mixture at low speed until just blended, then fold in chocolate chips. Cover and chill dough for 1 hour. Preheat oven to 375 degrees Fahrenheit (190 degrees Celsius). Drop spoonfuls of dough 2 inches apart onto ungreased baking sheets. Bake in preheated oven until cookies are set, 7 to 9 minutes. Cool 2 minutes on baking sheet; transfer cookies to wire racks to cool completely. It seems like forever (almost a year ago? really?!) since I featured a cookie recipe on this blog, which boggles the mind because 1) this is *supposed* to be a baking blog, and 2) I bake and eat cookies all.the.time. If I had to rationalize their omission, I’d say it’s because this blog – at least lately – primarily features my culinary experiments, rather than those tried and true recipes I’ve relied on for years. I have so many treasured cookie recipes passed down from my mother and grandmother that I’m often on cookie auto-pilot; in other words, I rarely branch out and try new recipes. Well, shame on me! There are literally thousands of incredible cookie recipes – this one included! – that I’ve overlooked in my haze of childhood cookie nostalgia. I take heart in the fact my Grandma Bonnie would have LOVED these Coconut Chocolate Chip Cookies – she was a sucker for anything with coconut and chocolate – and forgiven my wandering taste buds. These cookies are soft and chewy, over-sized (which is the best cookie size, amirite? ), and not overly coconut-y. They’re best enjoyed 10-15 minutes out of the oven – when they’re still a wee bit warm and gooey on the inside – but can be zapped for a few seconds in the microwave for a similar effect. Preheat oven to 350° Fahrenheit (175° Celsius). In a large bowl, cream butter and sugars until light and fluffy. Add eggs, one at a time, beating well after each addition. Beat in vanilla. Combine the flour, baking soda, baking powder and salt; gradually add to the creamed mixture and mix well. Stir in the coconut and chocolate chips. Shape two tablespoonfuls of dough into a ball and place 3 inches apart on a baking sheet; repeat with remaining dough. Bake in preheated oven for 12-14 minutes, or until lightly browned (13 minutes was the sweet spot for my oven). Remove to wire racks to cool. I’ve been looking forward to making these yummy pumpkin cinnamon rolls since discovering the recipe last year on the brilliant and beautiful blog Sweet and Savory by Shinee. Because pumpkin and cinnamon rolls deserve each other, and I’m nothing if not a slightly reckless matchmaker. I was hoping I could try this recipe after the arrival of my household goods, as the use of a rolling pin makes rolling infinitely (and obviously) easier. But as usual, my sweet tooth and reckless abandon won out as I found myself pulling all the ingredients off our market shelves without hesitation last week. Fast forward to Sunday morning, when I then found myself staring down step 5 with a smidge of doubt and a dash of disappointment. “Roll out on a floured surface into a large rectangle approximately 18 x 15 inches”, you say? Hmmm. Perhaps I should have waited for my rolling pin to arrive after all. But I’m nothing if not resourceful (and a little reckless – did I mention that? ), so I scoured my pantry for something – anything – to get my rolls back on track. Can of soup? Too small. Husband’s obnoxiously giant bottle of protein powder? Too unwieldly. Half empty, mostly stale old tube of Pringles? Now we’re talking. Long story short, you too can make these incredibly delicious cinnamon rolls with a can of Pringles that should have been thrown away two months ago. Or a rolling pin, if that’s your thing. Just make them. Because pumpkin and cinnamon rolls should have gotten together a lonnng time ago. Because it’s still socially acceptable to pimp pumpkin. And because they’re freaking amazing, and you haven’t made cinnamon rolls in a long time (or maybe ever?!). Enjoy in moderation! Mix together brown sugar, ground cinnamon and ground nutmeg. Set aside. In a large mixing bowl, combine dry active yeast and warm water. Let it sit for 10 minutes. In a medium bowl, whisk together flour, sugar, baking powder and salt. Set aside. In a mixing bowl with yeast, add pumpkin puree, buttermilk, egg and flour mixture. Knead* for about 6-7minutes until the dough becomes smooth and elastic. Transfer the dough into large oiled bowl. Cover it with wet towel and put it in a warm place for an hour to rise. I put it in a microwave with glass of hot water. Once the dough has doubled in size, roll out on a floured surface into a large rectangle about 18x15in. Pour melted butter and spread it evenly. Leave about half an inch on opposite edge of the dough. Sprinkle brown sugar mixture over the butter. Wet the opposite edge of the dough that has no butter and filling. Preheat the oven to 350 degrees Fahrenheit (175 degrees Celsius). Bake the rolls in a preheated oven for about 25 minutes, or until the top is nice and brown. Cool on wire rack while making the glaze. In mixing bowl, whisk together cream cheese, condensed milk and Pumpkin Spice coffee creamer on medium speed until smooth. 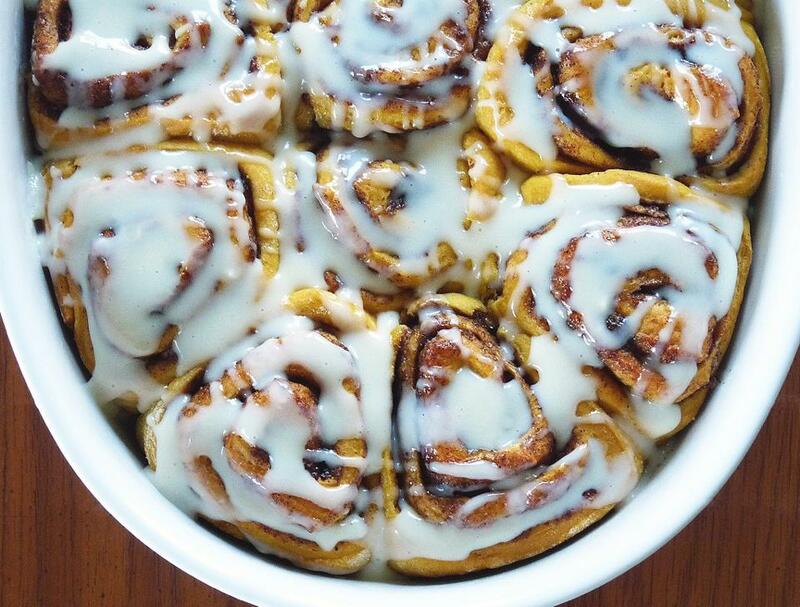 Pour over the warm pumpkin cinnamon rolls. Serve warm. *Note: You don’t need a stand mixer to make this recipe. You can easily mix all the ingredients with a wooden spoon and knead the dough by hand for 6-7 minutes, or until the dough becomes smooth and elastic. Every Halloween for the last few years, I’ve tried my hand at a new doughnut recipe. I’ve struck gold in the past with flavors like Apple Cider and spiced Pumpkin, and had high hopes that these little guys – fashioned after the Girl Scout cookie classic, Samoas (also known as Caramel deLites) – would be just as yummy. Mission accomplished! The combination of sticky caramel, crunchy toasted coconut and semi-sweet chocolate was divine, if not a wee bit messy (which just means ooey-gooey delicious, right?). The recipe below makes 12-15 miniature doughnuts – perfect for a brunch treat or a morning meeting in the office. Enjoy! Tip: Make sure that you use a slightly thickened (but still drizzly) caramel sauce rather than a caramel syrup. The thickness of the sauce helps the coconut adhere to the doughnut’s surface, preventing the whole thing from falling apart while eating. Preheat oven to 425 degrees F. Coat a mini donut pan with nonstick spray. In a large bowl, combine flour, sugar, cornstarch, baking powder and salt. In a large glass measuring cup or another bowl, whisk together milk, vinegar, butter and egg. Pour mixture over dry ingredients and stir using a rubber spatula just until moist. Scoop batter evenly into donut pan. Place into oven and bake for 4-5 minutes, or until donuts are slightly browned and spring back when touched. When the donuts are done, cool for 10 minutes and dip the top into the salted caramel. 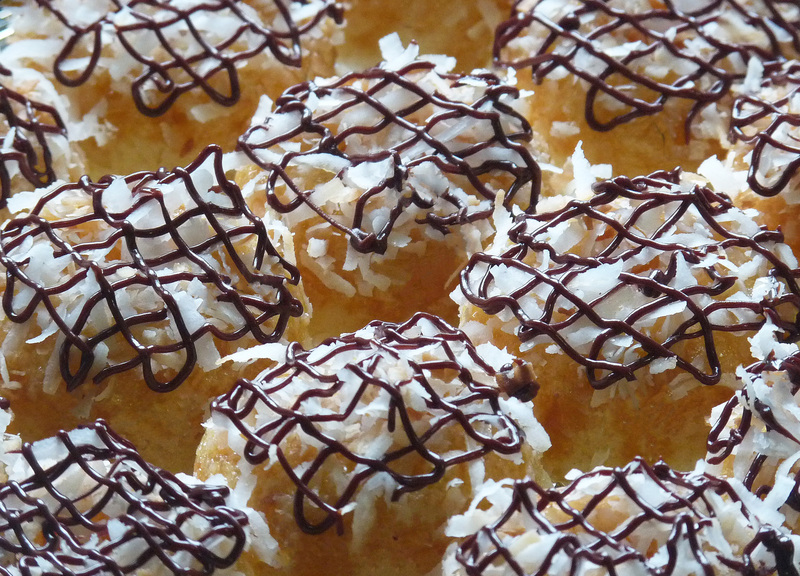 Sprinkle with toasted coconut flakes and drizzle with chocolate. Allow chocolate to set before serving.